Grab a raft and take a ride down the mighty Mississippi with Huck Finn and friends in the Children’s Theatre Company’s production of Huck Finn. Directed and adapted for the stage by Greg Banks, Huck Finn is based on Mark Twain’s novel The Adventures of Huckleberry Finn. Lead by CTC Acting Company member and audience favorite Dean Holt as Huck, Huck Finn continues the story of Huckleberry Finn originated in Twain’s novel The Adventures of Tom Sawyer. As the show opens Huck isn’t thrilled with his new life of manners, school and church while living with his adoptive mother the Widow Douglas. But at Tom Sawyer’s request he sticks with his new life in order to be a part of Tom’s new “robbers’ gang”. But it isn’t long before Huck’s drunken and abusive father Pap (Reed Sigmund) returns and demands Huck’s money. Soon after Pap kidnaps Huck and holds him in a cabin across the river from St. Petersburg. After faking his own death and escaping Pap’s cabin, Huck hides out on Jackson’s Island for a few days where he encounters Jim (Ansa Akyea), one of Miss Watson’s slaves. Once Jim and Huck team up, the real adventure along the Mississippi begins. 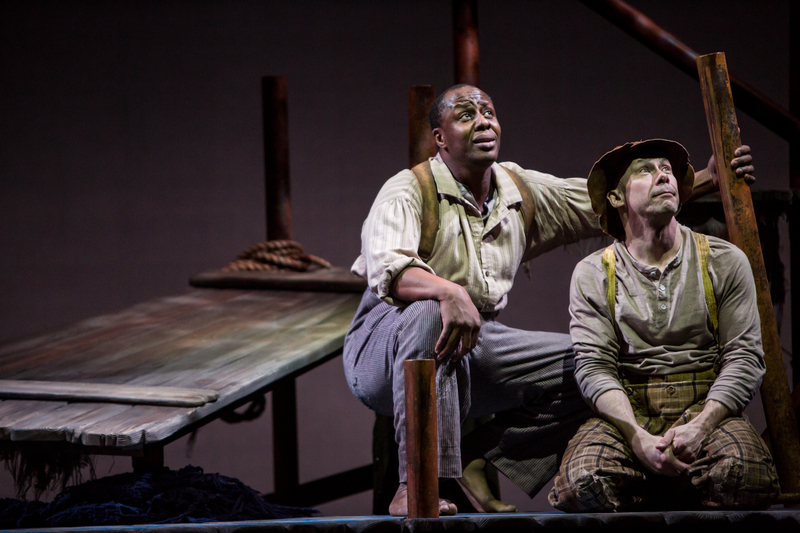 Dean Holt is captivating as Huck Finn. His ability to move nimbly from one area of the stage to the next plays a huge part in his embodiment of the character. You aren’t watching a grown man take on the role of a 14 year old boy. You feel as though the actor himself, is a 14 year old boy. Reed Sigmund and Ansa Akyea tackle numerous roles throughout the show, including Tom Sawyer and Jim. Transitioning from one character to the next with incredible ease and never skipping a beat. Musicians Joe Cruz and Victor Zupanc play more than just their instruments in this production. They also pull out their acting skills and take on the roles of a few ferocious dogs. At first glance the set looks like a simple jungle gym or children’s fort. Understated and simple, but Director Greg Banks fully utilizes the set designed by Scenic Designer Joseph Stanley. The set transports us from St. Petersburg Missouri, down the Mississippi and back. Serving as a house, raft, paddleboat, Jackson’s Island, a field and the river banks. This production is perfect for introducing children to the world of Huck Finn, Tom Sawyer and Jim. The characters, who first graced the pages of Mark Twain’s two Great American Novels come to life on the Children’s Theatre Company’s stage through April 4. For more information on the show visit the Children’s Theatre Company’s website.